Christmas is nearly here. And, whether you celebrate Christmas, or not, it is surely a time for compassion. 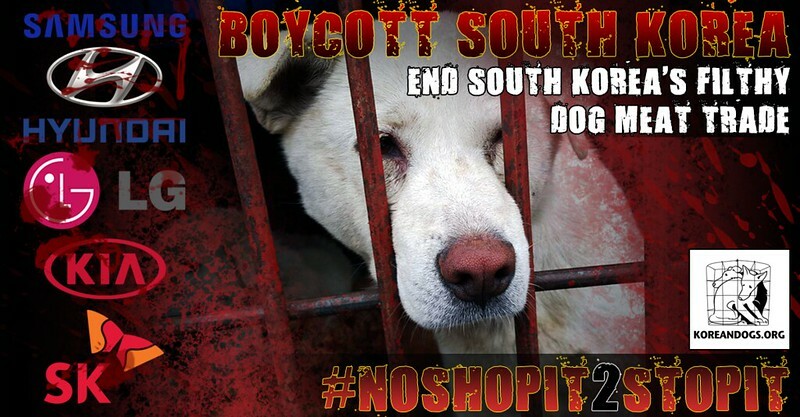 Let’s show our united compassion for the dogs and cats in the South Korean meat trade: by NOT supporting the South Korean economy – let’s STOP buying their products: let’s BOYCOTT South Korea. The big bosses of these profitable South Korean Companies have been told, and asked to do what they can to stop these abominable trades. They have chosen to do nothing – they are not interested in our words, so let’s make it clear with our (withheld) buying power – let’s stop buying South Korean products; go into your local outlets (or on-line) and tell them that you will not buy any South Korean Products until the South Korean Government commits to ending the brutal dog and cat meat trades – tell them: #noshopit2stopit . Or, simply send a flash tweet or e-mail to any place that sells South Korean products , no other message needed! The big bosses of the big companies don’t seem to care, but the salesmen in your local outlets will care. No sale, no profit – no profit, no job. Share the below posters EVERYWHERE including the social media pages of South Korean companies! Click HERE for contact information of South Korea’s major companies. I do it since almost 2 years, when I saw for the first time what happens there !!! I cannot even look at the korean cars or other korean stuff !!! I see immediately the dog eaten nation !!! and it makes me vomit !!! I am so disappointed seeing that new president of this country is still doing nothing !!!! they know now what is their image around the world ! the shamefull image !!! I´ve stopped buying products from South Korean, Chinese … and other countries that still allow the consumption of dog- or cat-meat since a long time. No Samsung iPhone or LG-TV for me! No other products from all these countries will open my purse. If You love dogs, cats – PLEASE follow in boycotting products from these countries. NEVER underestimate the power of the buyer. Thanks to everyone who will follow to boycott. Yes, I already stopped visiting South Korea and buying their products. I hate this country until they prohibited any dog meat trade!! Shame on this country!!! South Korea and China I completely boycott your products and my friends and family do the same. Evil people beyond belief. What happened to President Trump…Stop The Trade with China???????? Stinking sickening practice. You need to be caged! Why would anybody want to eat a dog. They are like our family. They give us comfort and companionship when we have nobody else. They make a home a happy place for children and families. I hope every one of you get rabies,, or parvo, or distemper from one of the dog diseases that kill you. After I realized that South Korea and China are dog eating countries and their presidents don’t do anything to stop this, I have decided that I will never again buy products which are produced in these countries, shame on them. EVEN THOUGH SOUTH KOREA HAS ESTABLISHED AN ANIMAL PROTECTION LAW FOR COMPANION ANIMAL. DOGS AND CATS CONTINUE TO BE BEATEN, HUNG, SKINNED ALIVE, ELECTROCUTED, AND TREATED BRUTALLY; DOGS AND CATS ARE STILL BEING BOILED ALIVE. ALL OF THIS IS BECAUSE IGNORANT PEOPLE PROMOTE VIOLENCE, CRUELTY, INSENSIBILITY, UNCONSCIOUSNES IN OUR WOLRD. AN ESTIMATED 2.5 MILLION DOGS AND CATS ARE CRUELLY SLAUGHTERED EACH YEAR IN SOUTH KOREA. THEIR LIVES AND DEATHS ARE A NIGHTMARE OF UNIMAGINABLE AGONY AND SUFFERING. THIS HEARTLESS BRUTALITY AND CRUELTY MOST BE STOPPED NOW. WE NEED TO STAND STRONG AND RESOLUTE AGAINST THIS BARBARIC INDUSTRY, A HEINOUS PRACTICE THAT HAS CAUGHT THE ATTENTION OF MILLIONS OF PEOPLE AROUND THE WORLD. IT IS ENOUGH! THIS CRUELTY PROMOTES VIOLENCE BETWEEN US. WE HAVE TO EVOLVE AND BE MORE SENSITIVE, MORE COMPASSIVE, AND BETTER HUMAN BEINGS. NO LIVING BEING DESRVES SUCH A TORTUROUS EXISTENCE, FORCED TO ENDURE THE MOST EXTREME CRUELTY AND UNIMAGINABLE TORMENT FROM THE MOMENT THEY ARE BORN UNTIL THE DAY THEY ARE BRUTALLY SLAUGHTERED. WE DON´T SEE THIS ISSUE AS A “CULTURAL DIFERENCE”, WE LOOK AT THIS ISSUE WITH UNBRIDLED COMPASSION. WE NEED TO USE WHATEVER MEANS OF METHODS WE CAN TO ADD OUR VOICES TO THE MANY ALREADY CALLING FOR CHANGE IN SOUTH KOREA. ALL OF US NEED TO ADD OUR VOICES TO SOCIAL MEDIA AND OTHER CAMPAIGNS. THIS IS OUR OPPORTUNITY TO HELP CHANGE THE LIVES OF SO MANY DOGS AND CATS CONDEMNED TO A LIVE IN THE MEAT TRADE. IF SOUTH KOREA KNOWS THAT THE WORLD IS WATCHING AND IS ASKING FOR CHANGE, AND IF SOUTH KOREA WANTS TO BE RESPECTED AS A NATION WITH CONSCIENCE; SOUTH KOREANS NEED TO STRENGTHEN THEIR ABYSMAL AND OUTDATED ANIMAL WELFARE LAWS AND PERMANENTLY BAN DOG AND CAT CONSUMPTION. 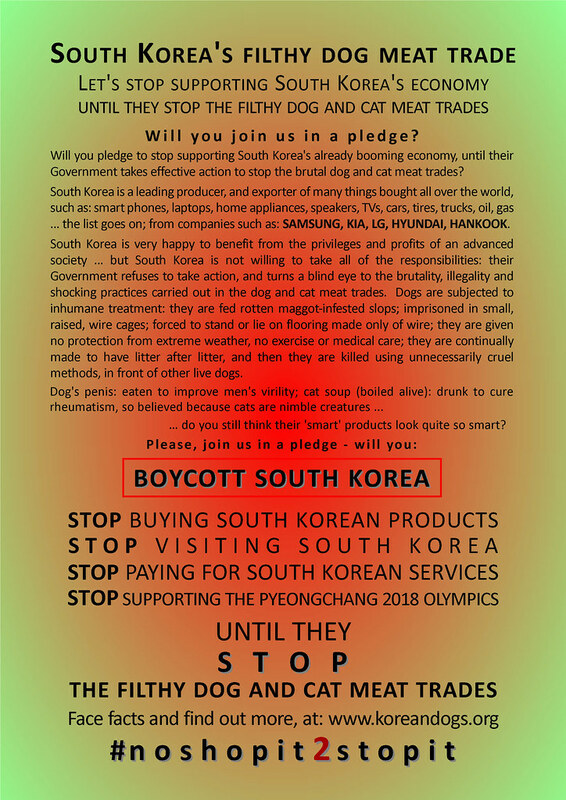 i pledge to never buy or own anything from south korea and china along with any other dog and cat eating nation. Stop the evil sickness of the trade and consumption. A horror beyond belief. I love dogs and cats. To me they are gifts from GOD! I will never buy a car, smartphone or any other product made in Korea! There has to be a way to dispel the myth that torturing the dog produces better meat … I hope they change their culture to be more humane. Their is no way to be more humane other than to stop eating Dog you souless people, find Christ ! BOYCOTT ALL GOODS FROM ALL COUNTIES THAT COMMIT THIS HEINOUS CRIME. I certainly won’t buy anything from Korea. Whatever I buy, I always look to see where it’s made. Anyone that eats a companion animal such as a dog is just without a heart or soul. I only buy “made in U.S.A.